Which of the following r are true for a rhombus? It is not a square because each of the angles is a right angle in a square. (i) A rhombus is a parallelogram in which …. (iii) A rhombus has all its sides of …..length. (iv) The diagonals of a rhombus ………each other at…… angles. 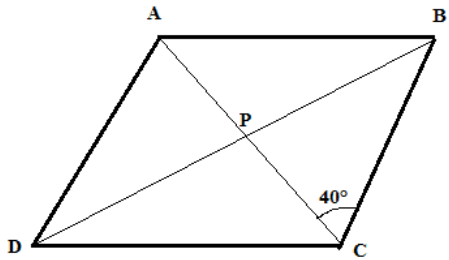 (v) If the diagonals of a parallelogram bisect each other at right angles, then it is a …. No, it is not a rhombus. This is because diagonals of a rhombus must be a perpendicular. The diagonals of a quadrilateral are perpendicular to each other. 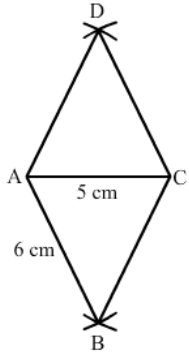 Is such a quadrilateral always a rhombus? If your answer is ‘No’, draw a figure to justify your answer. No, it is not so. Diagonals of a rhombus are perpendicular and bisect each other. Along with this, all of its sides are equal. 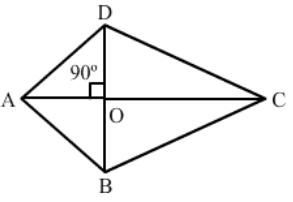 In the figure given below, the diagonals are perpendicular to each other, but do not bisect each other. ABCD is a rhombus. 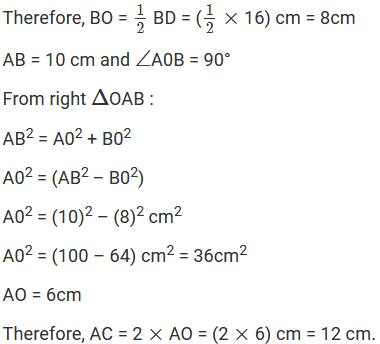 If ∠ACE = 40°, find ∠ADB. In a rhombus, the diagonals are perpendicular. 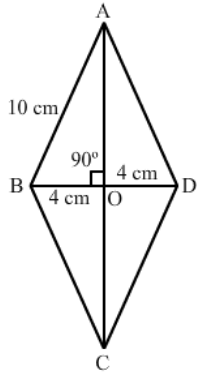 From Triangle BPC, the sum of angles is 180°. If the diagonals of a rhombus are 12 cm and 16 cm, find the length of each side. All sides of a rhombus are equal in length. The diagonals intersect at 90° and the sides of the rhombus form right triangles. One leg of these right triangles is equal to 8 cm and the other is equal to 6 cm. The sides of the triangle form the hypotenuse of these right triangles. The hypotenuse is the square root of 100 cm2. This makes the hypotenuse equal to 10. Thus, the side of the rhombus is equal to 10 cm. 3. With O as centre and radius equal to half of the length of the other diagonal, i.e. 3 cm, cut OB = OD = 3 cm. 3. With A as the center and the radius equal to AB, cut AD at 3.5 cm. 4. With D as the center, cut an arc of radius 3.5 cm. 5. With B as the centre, cut an arc of radius 3.5 cm. This arc cuts the arc of step 4 at C.
1. 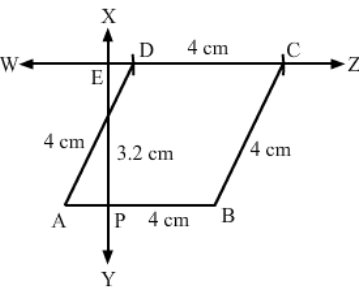 Draw a line segment AB of 4 cm. 3. With P as the center, cut PE at 3.2 cm. 5. With A as the center, draw an arc of radius 4 cm that cuts WZ at D.
6. With D as center and radius 4 cm, cut line DZ. Label it as point C.
7. Join AD and CB. 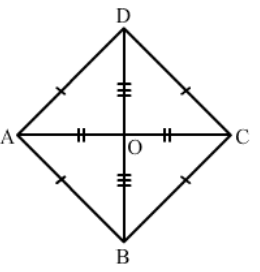 ABCD is a rhombus and its diagonals intersect at 0. (i) Is ΔBOC = ΔDOC? State the congruence condition used? (ii) Also state, if ∠ BCO = ∠DCO. Similarly, we can prove ΔAEB and ΔBEC, ΔBEC and ΔDEC, ΔAED and ΔAEB are congruent to each other. Hence, diagonal of a rhombus bisects the angle through which it passes. 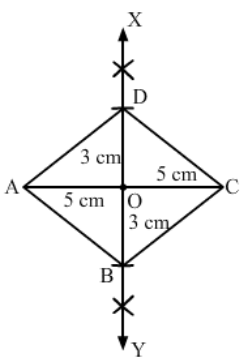 ABCD is a rhombus whose diagonals intersect at 0. 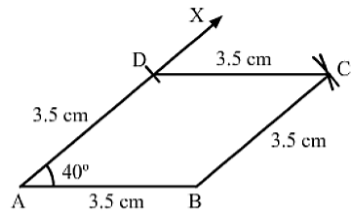 If AB = 10 cm, diagonal BD = 16 cm, find the length of diagonal AC. We know that the diagonals of a rhombus bisect each other at right angles. 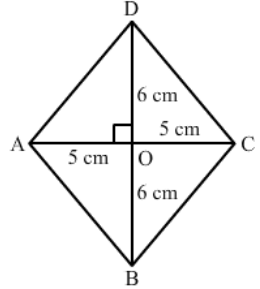 Let the given quadrilateral be ABCD in which diagonals AC is equal to 6 cm and BD is equal to 8 cm. Also, it is given that the diagonals bisect each other at right angle, at point O. 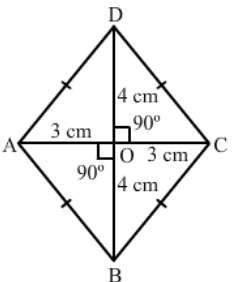 Thus, the length of each side of the quadrilateral is 5 cm.